What’s Better For Your Shiba Inu – A Harness or a Collar? 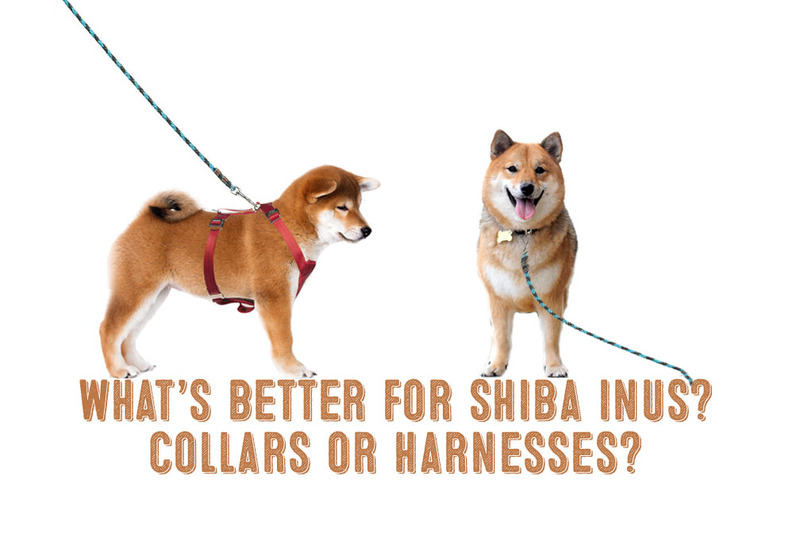 Many new Shiba Inu owners have been asking the question, "what's better for a Shiba Inu - a harness or collar?" 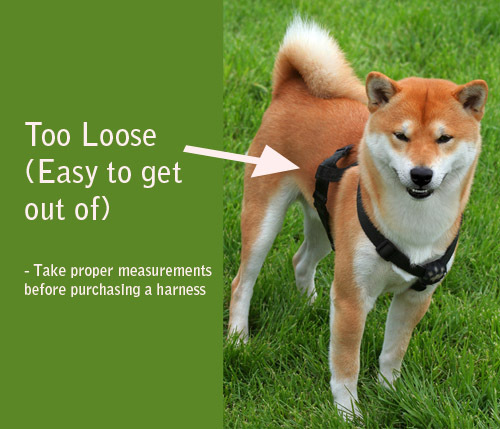 For most Shiba Inu owners, the use of both collars and harnesses is common. However, many owners are not exactly aware of the differences and uses for both collars and harnesses. 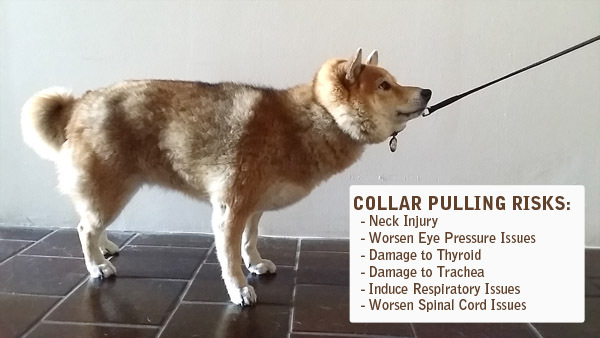 Additionally, not all Shiba Inu owners are aware about the dangers of using collars on their Shiba Inus in certain situations. 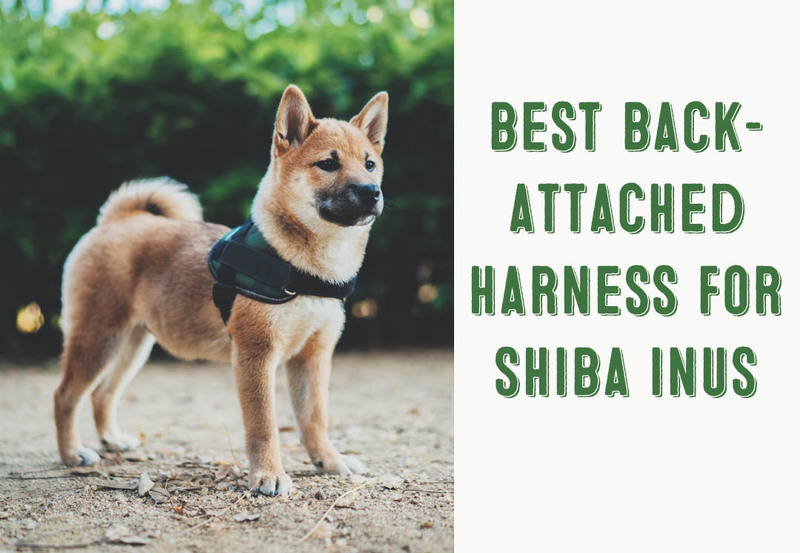 Read on to learn more about the types of harnesses and collars and their uses so you can decided which option is best for your Shiba Inu. 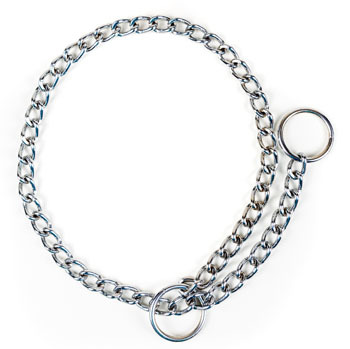 The dog collar has long been one of the most commonly used and recognized dog accessory in the world. It hold's the dog's i.d. tags as well as clips on to a leash. Everybody understands a dog collar. 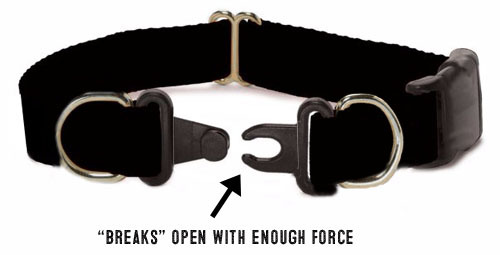 ​However, not everybody understands that dog collars are not ideal for every situation and every dog. ​Dog collars are great for trained dogs that do not have leash pulling issues and are not collar escape artists. 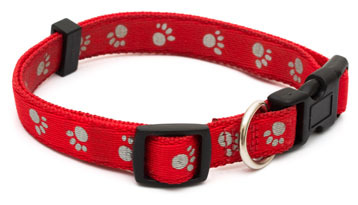 Dog collars are convenient because they are quick to put on as well as take off. B​ut what about the dogs that are not leash trained and are skillful escape artists? Like, perhaps your Shiba Inu? ​Well if that's the case, then using collars with a leash may not be the best choice for all situations. Keep in mind that even though you decide to use a harness, your dog should always have a collar with identification tags on at all times. ​If your dog is not yet properly trained to walk on a leash, collars are easier than harnesses to slip out of. Collars can cause neck injury in dogs that pull excessively and forcefully. Collars are also contraindicated in untrained dogs that have certain medical issues as well as for dogs that have certain physical attributes. ​One of these medical contraindications that affect Shiba Inus involve eye pressure and eye conditions such as glaucoma and thin corneas. ​Shiba Inus are known to be affected by eye problems such as glaucoma which is caused by excessive eye pressure. A 2006 study done by the Journal of the American Animal Hospital has found that pressure of collar pulling worsens the progression of eye disease including glaucoma. ​For this reason, it is of great importance that you train your Shiba Inu to walk correctly on a leash. 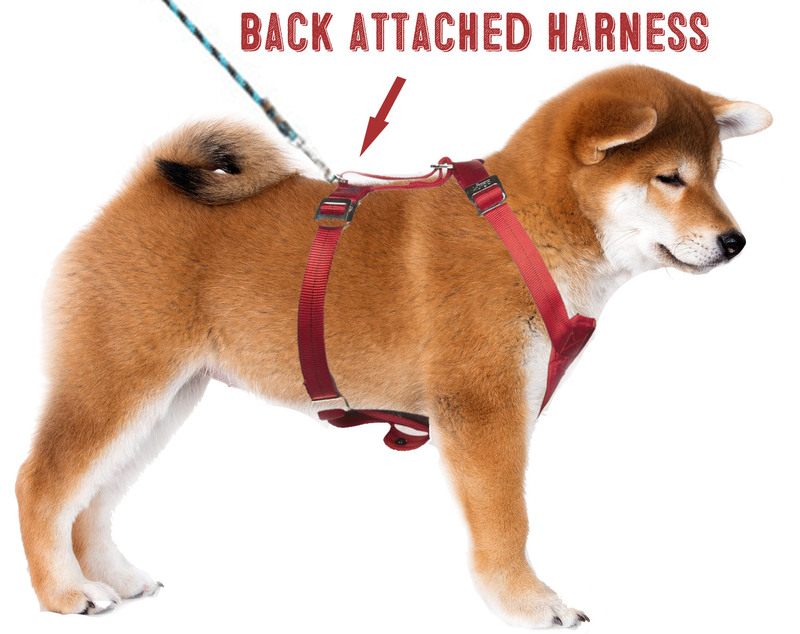 If you have a particularly difficult Shiba Inu "puller", you should utilize "no-pull" harnesses instead of collars until your Shiba is properly trained. ​As you can see, there are quite a number of choices in collar types. Regardless if you use a collar of a harness for leash walking, you should always have a collar on your dog to hold I.D. tags and other important information. 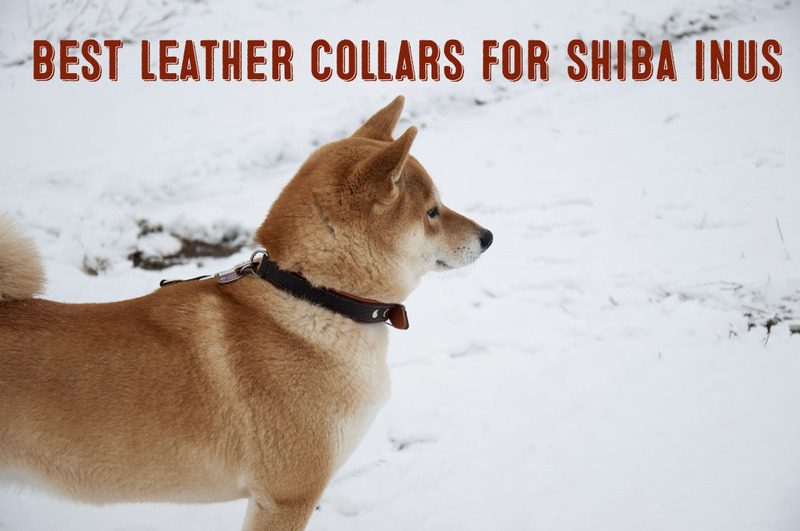 ​Our most recommended collar for Shiba Inus is a standard flat leather collar. 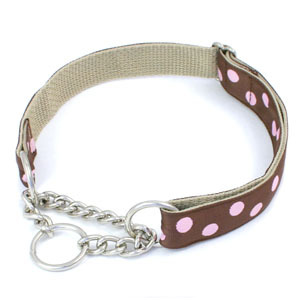 These types of collars are durable and long-lasting. They are also less likely to cause skin irritation on your Shiba Inus. ​If you are still in the process of leash training your Shiba, head halters such as the Gentle Leader can help speed up the training process. However, you will need to learn how to properly use the halter before beginning training. Additionally, no-pull harnesses, which are described in the part of this article is also a helpful training tool. ​We do not ever recommend aversive training collars. In the hands of an untrained handler - these collars cause more harm than good. Read more about the dangers of choke collars here. Mar​tingale collars are fine to use, especially for Shiba Inus with broad necks and smaller heads. ​For Shiba Inus, we do not recommend breakaway collars. Shiba Inus are strong dogs that are more likely to get hurt by running away due to the breakaway function versus getting choked by accidentally becoming lodged into something. ​Breakaway collars are better suited for hunting or retrieving dogs that have a much higher risk of getting stuck in brush during their hunts. These dogs, unlike most Shiba Inus, are trained to come back when recalled. ​Harnesses are commonly used on dogs for a variety of different reasons and scenarios. ​Most commonly, harnesses are used for dogs that cannot use collars for walking due to their physical features or medical issues. Harnesses do not put excessive pressure on dog's necks and are less of a choke hazard than collars. ​You will also probably notice that most small, toy breeds use harnesses instead of collars for leash walking. That's because toy breeds have fragile necks and collar pulling could cause harm. ​Harnesses are also used for dogs with a variety of medical issues that usually involve their necks or eye pressure. With Shiba Inus, harnesses are highly recommended due to the fact that Shibas are susceptible to Glaucoma. Excessive collar pulling and yanking can detrimentally affect your Shiba Inu's eye pressure and cause diseases like Glaucoma to worsen. 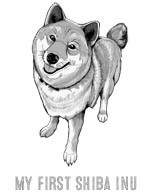 This recommendation is even higher if you have a Shiba Inu that is not leash trained. 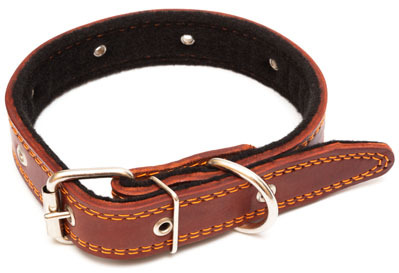 ​Additionally, correctly fitting harnesses are harder to get free from than collars. 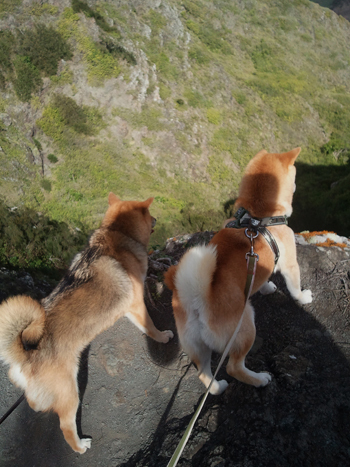 Since Shiba Inus are known to have the urge to flee, harnesses would be a better choice to keep your Shiba secure. 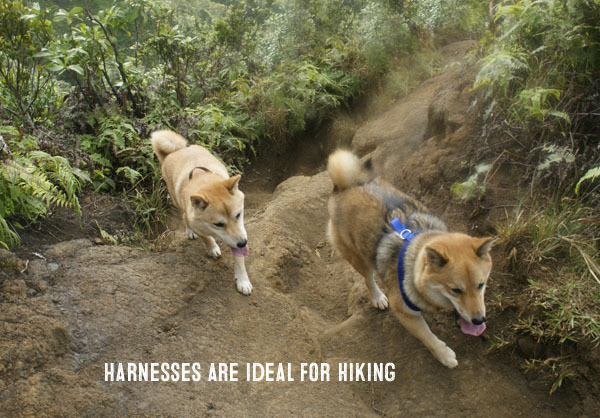 ​Harnesses also give dog owners more leverage. For example, in an event that you need to pull your dog up and out of something, you can grab a hold of the harness and pull. This feature is especially helpful during outdoor outings such as hiking. The two main types of dog harnesses are the back-attach harness and the front-attach or "no-pull" harness. These two types of harnesses look similar but serve very different purposes. Not surprisingly, many dog owners are not aware of these differences. 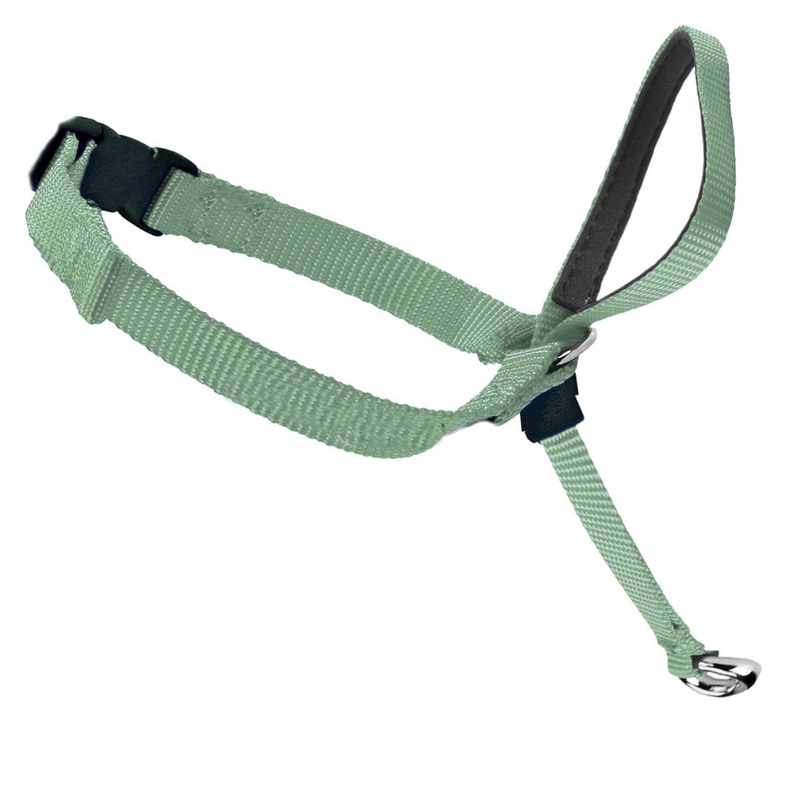 The more commonly used harness is the back-attach harness. These harnesses work fine for walking with leash trained dogs. However, for non leash trained dogs, back attach harnesses actually encourage pulling. To get a better visual, think of sled dogs. For certain situations like running or biking with your dog, back attach harnesses are ideal. However, if your dog pulls and is not leash trained for standard walks, back attach harnesses will not help much with the issue. Harnesses that attached to a leash in the front, or chest area of your dog discourages pulling due to its simple but effective design. Because the leash is attached to the front of the dog, any pulling motion will cause your dog to have to turn back towards you. This effectively breaks momentum and slows your dog done. Since it is highly likely that your dog wants to move forward, the no-pull harness will teach your dog that pulling will slow down progress. With patience and consistent training, a no-pull harness can effectively teach your dog to walk on a leash without pulling. Unlike collars, harnesses do not have as many drawbacks in terms of physical dangers or health risks. In fact, one of the main drawbacks of harnesses are that some dogs just don't like wearing them. Not a serious issue at all. The next main drawback is that harnesses take more time than collars to put on and take off. Again, not a serious drawback but more of a minor inconvenience. ​With the no-pull dog harness, there is some debate about whether this type of harness is bad for the natural gait of dogs - especially athletic, working dogs. However, even if this theory is valid, most dog behaviorists and trainers believe that the benefits of correcting a dog with leash pulling issues outweighs the slight risk of affecting a dog's gait - especially since this risk pertains mostly to highly athletic dogs. Read more about the issue here. ​Finally, the last main drawback of harnesses is finding one that fits correctly. Because dog body sizes are so variable, extra time must be invested to properly measure your dog and find a harness that fits securely and comfortably. Dogs, especially good escape artists like Shiba Inus can still escape from improperly fitted harnesses. ​So, What's Best? A Harness or a Collar? ​If you have read this article in it's entirety, you probably came to your own conclusion as to what's best for your Shiba Inu and your situation. If ​however, you skimmed all the way down to get an answer as quickly as possible. Here goes. 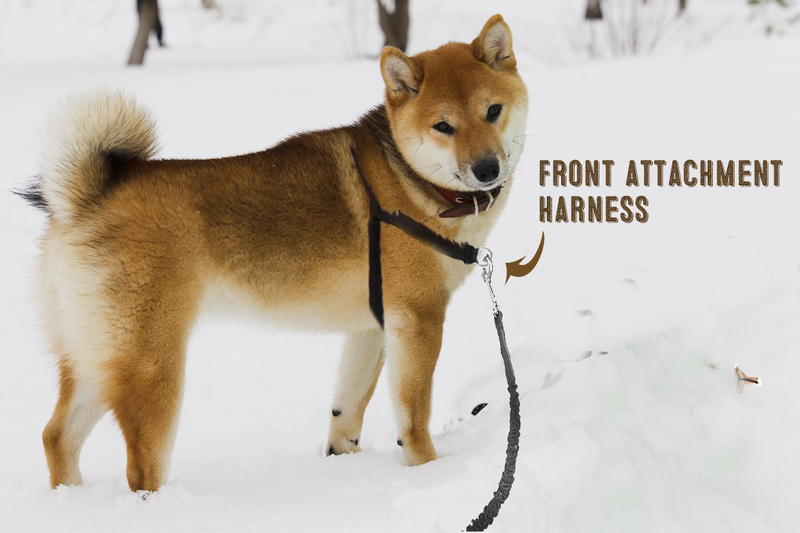 ​For most Shiba Inu owners, the use of both a collar AND a harness will be necessary for different situations. ​If you have a well-trained Shiba Inu with no leash pulling issues, walking with collars is fine for most "easy walking" situations. On hikes, runs, and bike rides - the use of a harness would be ideal. ​If you know your Shiba Inu will be in a situation that involves more active, or excitable walking, then it would better to use a harness. Examples of these types of situations would be walks with other dogs friends, or faster paced walks in busy areas, etc. ​If your Shiba is not properly leash trained, than you will need to use a harness at all times until your Shiba Inu becomes fully leash trained. For training purposes, you can experiment with using either the front attach harness and / or a head halter such as the Gentle Leader. ​Exclusive use of harnesses would be recommended for Shiba Inus that have medical contraindications mentioned earlier in this article (Glaucoma, thyroid, neck issues). With Shiba Inu puppies, harnesses should be used more often than collars due to the fragility of their tiny necks. However, it is still important to get puppies used to collar walking with gentle and patient leash training.